So thrilled to introduce ya’ll to a dear blogger friend of mine, Alex at Delicious Knowledge. 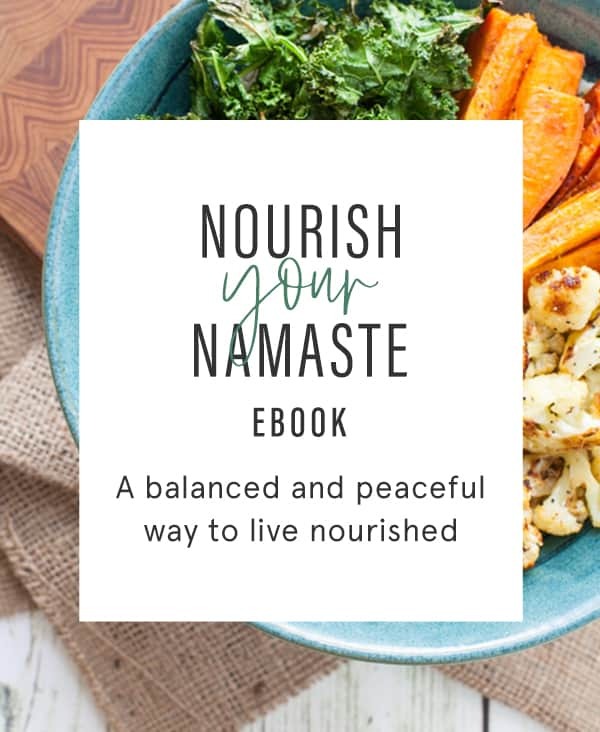 Alex and I have a LOT in common – we’re both yoga teachers, we both dish up inspired vegetarian and vegan eats, and we share a similar food philosophy on sticking to seasonal, whole foods. I finally had the pleasure of meeting her IRL at FNCE last fall. I drool over her recipes and pictures every week and I hope you’ll see why! Alex is hanging out with us on the blog today to share her Winter Panzanella Salad. First off, I am so excited to be guest posting today for Kara! 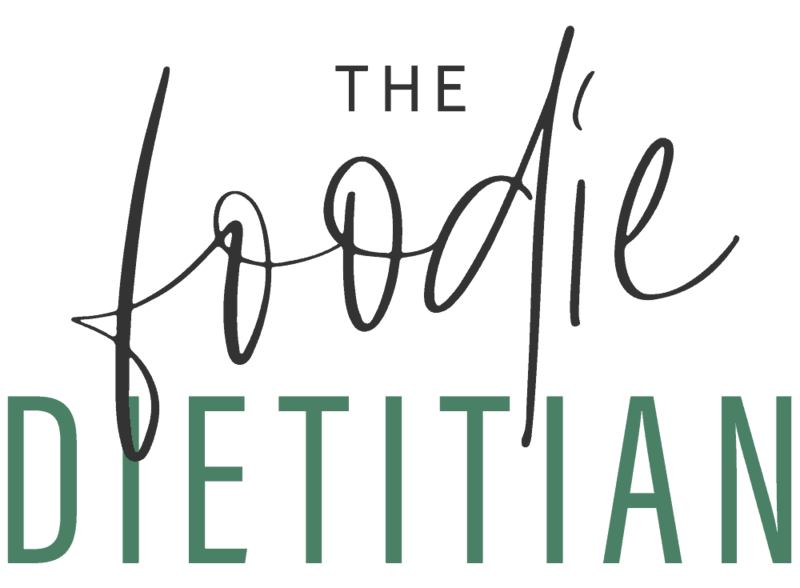 I am a huge fan of the Foodie Dietitian and can’t get enough of her Mindful Monday posts and healthy recipes! I’ve had the pleasure of knowing Kara for a few years, first through social media and then finally meeting at the RD conference last fall. Besides both being yoga instructors, I love that Kara and I share a similar food philosophy: vegetarian, whole foods, simple but delicious. As a fellow Registered Dietitian, I work with clients to help find foods that fit their lifestyle and nutrition needs. I don’t believe in counting calories or fat grams but instead counting foods that make you feel good. For example, my Winter Panzanella Salad. 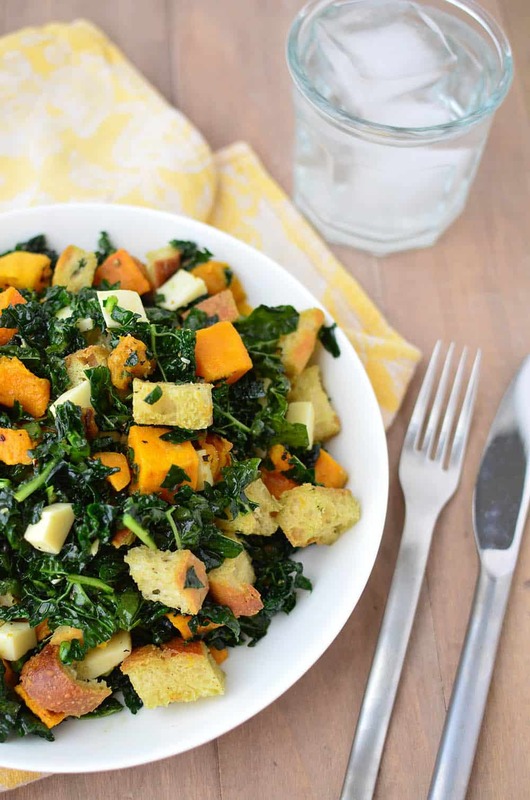 Lots of kale and roasted butternut squash tossed with day-old breadcrumbs, a lemon vinaigrette and smoked mozzarella cubes. During the summer, I eat panzanella salad almost weekly. As I have a slight obsession with fresh tomatoes, I can’t think of a better way to enjoy them than with fresh bread, torn basil, and good olive oil. For this version, I swapped the tomato for roasted butternut squash, kale for basil, and added some smoked mozzarella for good measure. For my vegan and dairy-free friends, feel free to leave out the cheese, although I think it rounds out the heartier flavors nicely. This salad is a testament to the fact that food doesn’t have to be complicated to be delicious. With only a handful of ingredients, this salad is hearty enough to be a main course and simple enough to be a side. If you want a little more protein and staying power, add in a cup or two of canned chickpeas- they taste great in this salad! Day-old, crusty bread tastes the best, but if you’re using fresh bread, slice it into cubes as you normally would. Then lightly toss with olive oil, salt and pepper. Place the cubes in a single layer on a baking sheet and toast until golden brown and crunchy! Just like the rest of us, Kale loves a good massage! After you make the dressing, make sure to rub the vinaigrette over the kale leaves. Don’t be afraid to use your hand! While salad tongs work, it’s much easier to roll your sleeves up and dig in. 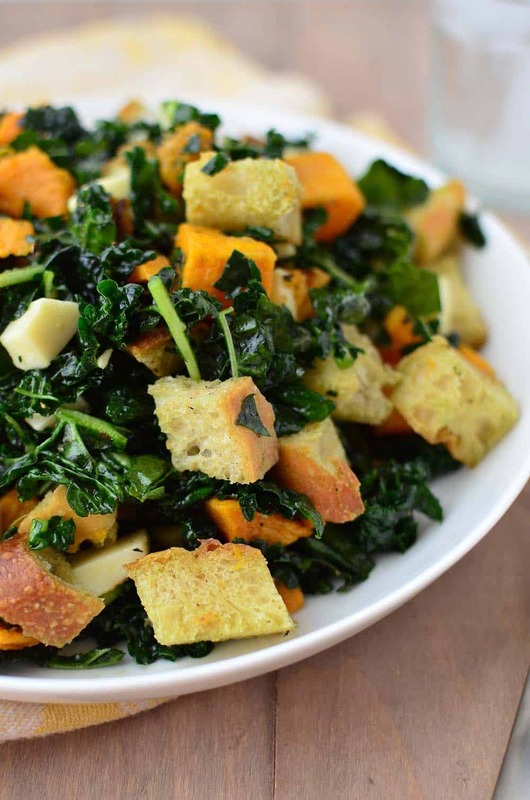 Kale tastes best to me when massaged with a smidge of dressing, plus this technique allows you to use less dressing than you normally would. Preheat the oven to 400 degrees F. Cube the butternut squash into bite size pieces and toss with ½ tbsp. olive oil, rubbed sage, and pinch of salt and pepper. Place in a single layer on a baking sheet and roast for 25-30 minutes until tender. Remove from oven and let cool slightly. 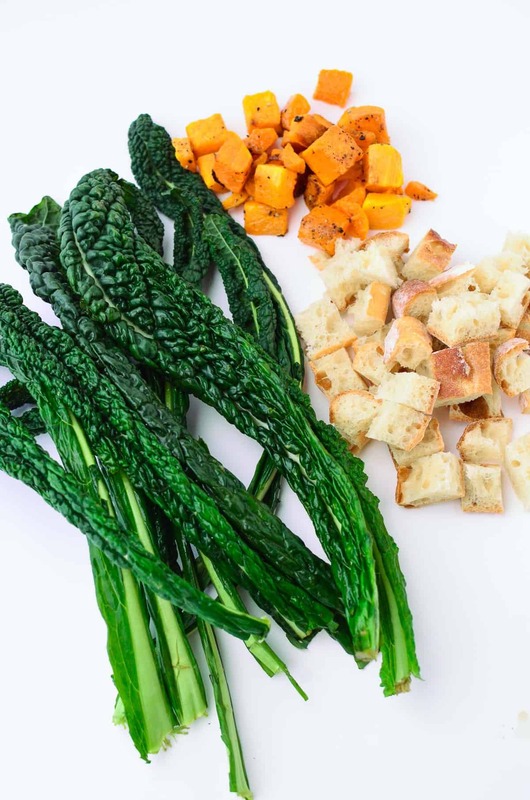 If you are using fresh bread, pop the cubes in the oven for the last 5 minutes of the squash cooking until they are crunchy and golden brown, set aside. In a small bowl, whisk together the lemon juice and minced garlic clove with a generous pinch of salt and pepper. The garlic clove should almost dissolve in the liquid. For finely mincing garlic, I like to use a zester/fine grater over my knife. Drizzle in the remaining olive oil and whisk to combine. Sprinkle in the red pepper flakes and taste for salt/pepper. Place the torn kale leaves in a salad bowl and add the dressing. Using your hands, massage the dressing into the kale for a minute or two until the kale is slightly wilted. Add in the remaining ingredients: roasted squash, bread cubes, and smoked mozzarella. Toss and serve. Big thanks to Alex for sharing her delicious recipe with us today! MMmm now this is my kind of salad, this sounds delicious! Right? It’s gorgeous! Enjoy, Holly! Two great RD bloggers- love reading both every week for great vegetarian and vegan recipes … And as a carb lover- I love the addition of bread into any salad! Aw, thanks, Jess! Me too – I usually have bread on the side, but why not throw it right in?! Another beautiful salad recipe from Alex 😉 She’s seriously the queen of salads!! This one looks delish! Haha so true, Meme! She’s got salads down to an art! Hi Kara! Hi Alex! I too love a good panzanella salad. I like the winter twist on this recipe. Beautiful pictures too! Thanks for introducing me to Alex’s blog Kara! My pleasure, Linda! She is a wonderful blogger – she puts so much thought into each and every recipe and picture. Delicious! I can’t wait to try this! Gorgeous pictures, too. I love Alex’s pictures too! Thanks for stopping by, Alli. Enjoy! This winter panzanella salad sounds delicious, I can’t wait to try it! 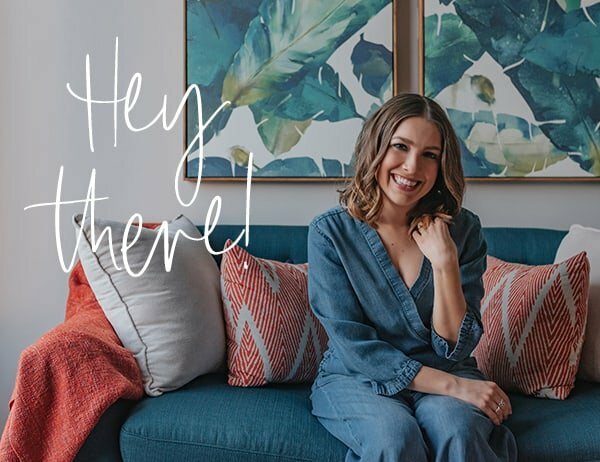 Thanks for introducing us to this blogger! Recipe looks awesome!